We live in a world of brokenness and inconsistency. When pressure mounts, we need a sure and secure confidence in what God is doing. In Nehemiah 6, we are introduced to a man of integrity who rises above the blame game and takes positive steps to recovery. For example, in Nehemiah 6:8–9, he calmly denies the charges; in verses 10–12, he carefully resists the pressure so that by verses 15–19, he confidently completes the task. If you were governor of Jerusalem looking for a man to take charge, what abilities would you look for? What qualities would stand out in your thinking, and where would you find such a person? Nehemiah was very blessed to have a brother with the same deeply rooted convictions and principles as him. Hanani is described as a man of integrity who feared God (Nehemiah 7:2). 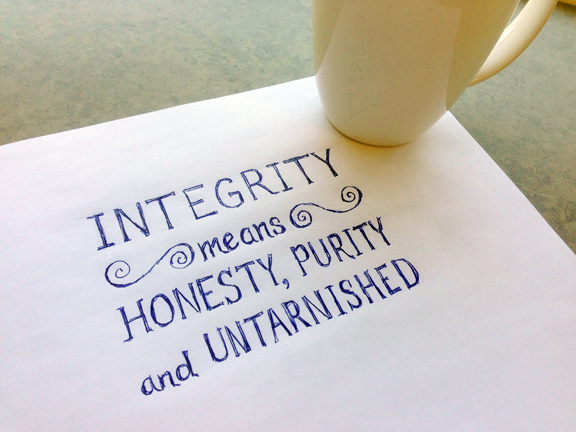 The word “integrity” in the Hebrew language means honesty and sincerity coupled with the idea of completeness. There are two aspects to this word integrity. One is “kalos,” meaning honour and honesty. The second colouring of integrity is “adolos,” which means pure or untarnished. (1 Chronicles 29:17). Job maintained his integrity, and further stated that his integrity was at stake (Job 6:29). Those seeking to find fault with Jesus said, “We know you are a man of integrity . . .” (Matthew 22:16). 1. How does the Hebrew definition of “integrity” help formulate your idea of what it means to be a man or a woman of integrity? 2. How is integrity related to justice and compassion? Is it a necessary character trait to do justice and to show compassion? Ernie Gray is National Chaplains Coordinator for the Association of Alliance Chaplains. Alliance Chaplains minister in communities that are often beyond the reach of the traditional church, such as in hospitals, prisons, and the Armed Forces. They represent Christ in the midst of everyday life and in extraordinary circumstances. Click here to learn more about Alliance chaplains. Your blog reminds me of a line from one of the Tom Cruise miveos . Help Me Help You . Chewing on that for a second, I make the connection that if the 80% you speak of believed that helping their neighbor would ultimatly help themselves by improving the quality of life, we would be one step closer to transitioning our community from a group of mostly strangers to a close knit family. The long pole in that tent of course is getting the buy-in of the 80%. I see and hear many of those 80% acting as though they must take care of #1, so no real time is left for the team approach. I believe they are crying out . Tell me there is more to life than this ? I think most, certainly more than the 20%, want to belong and participate in a larger purpose in life than they see everyday. Getting them connected to a vision larger than themselves sounds like a leadership challenge for the 20% . Good stuff! Standing by for those equipping tools! Markus we need strong, godly leadership who are passionate about the honor of the Name of the Lord. True compassion moves us to action as in the illustration of the Good Samaritan. Broken walls yes, broken people surely all need to be assisted to their place of meaning and significance in the big picture. It is in my mind only people of integrity to bring wholeness and healing to our world without selfish ambition and recognition. I like the comment made by one serious follower of Jesus who said, ” Let me hide behind the cross so others will see only Christ.” Your ratio of 80 to 20 is probably an accurate picture of where we are at today. History does teach us what one man or woman who is wholly committed to God can make a difference in our world. Let’s be that person.